Vintage crossbody bag and bracelet. New York weather has been stormy and on-and-off the past few days - think 90 degrees, then pouring - which makes it almost impossible to dress appropriately, no matter how hard you try. What are your plans this weekend? We'll be in Fire Island with 13 of our friends, praying for better weather than the forecast predicts. Wish us luck! Cute pants dear! Love the boots! soooo in love with those pants!! These pants are awesome! I love the print. I just got back form the lake... and now I'm waiting for this massive thunderstorm to pass... stupid indecisive weather!! Always love the 80%20 kicks you have on here. what a great pair of jeans you've got there! It is really impossible to dress for this weather. UGH. Anyway I LOVE the print of these jeans. Crazy fun pants! Also loving the bodice detail on the tank! Brick wall background...yes! cute pants and J'ADORE the ombre hair. lovely. that's it...i am buying booties NOW. =) you look gorge girl!!! Looooove those pantalones! Love them cuffed and with those adorbs ankle booties! I love the pants, you look really pretty! Sorry about the stormy weather! It does make deciding what to wear tricky. Love the print on these jeans though and such a great backdrop. Perfect pics! The weather's been like that here – you are correct that it makes getting dressed SO difficult. I am loving these jeans and boots – I've got a different pair of 80%20 boots with a hidden wedge – love that. You mean to say you're not sharing closets for these pants?! Nice! Love the pattern! you pictures are so great! It's a very nice outfit and i love your pants. These photos are really great too. Those boots and pants are beyond fabulous! 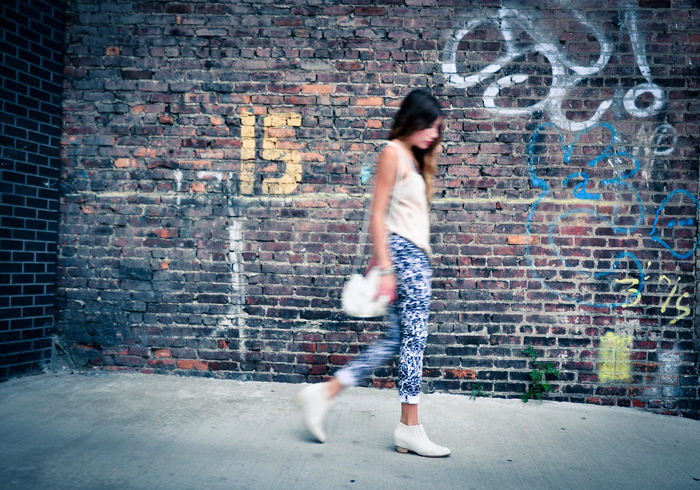 I love the fun printed pants and the pretty camisole/booties you've styled them with! Perfect styling!